CGPSC Assistant Professor Syllabus: Download the CGPSC Assistant Professor Exam Syllabus mentioned below. The official website @ psc.cg.gov.in has provided the same in form of Annexure 2. We have provided the link to download the annexure. It is in Pdf form and includes all the subjects as well as important topics to consider. All the applicants are requested to go through the article carefully and begin preparing on the basis of the annexure linked. Steps to download syllabus are provided too along with the proper path for the same. Basically, the online examination is an MCQ test. This would be for 300 marks and 150 questions. The last page of the official advertisement Pdf has all the marking scheme and exam details. Details are mentioned in the Hindi language. The question paper is divided into 2 parts. Part one deals with the General Knowledge of Chhattisgarh related questions (50 questions) and part 2 deals with the field or vacancy related questions (100 Qs). Marking scheme also varies for both of these parts. Ensure that the entire CGPSC Assistant Professor Syllabus Pdf is checked thoroughly. It includes all the subjects and topics those subjects include. Focus more on the second part of the question paper that includes field related questions. Final selection will be based on written examination and interview both. Applicants, please note that complete syllabus is provided on the official website @ psc.cg.gov.in. Examination scheme and marking scheme is mentioned in detail in the last page of the official recruitment Pdf. Kindly check the image below. There are 2 stages of selection procedure and both are equally important. As mentioned above there is an online MCQ test for 300 marks and an interview for 30 marks. Candidates need to clear both of them to get selected. Combined performance in both the stages matter to get a seat among 1384 Assistant Professor vacancies. There is a separate formula declared by the recruitment board for the final selection. Please go through the image above thoroughly in order to understand the marking scheme for MCQ examination and CGPSC Assistant Professor Merit List 2019. The written examination is an MCQ test of 300 marks. These 300 marks are further divided in to 2 parts of question paper. Part 1 includes General Knowledge of Chhattisgarh for 100 marks and 50 questions. Part 2 includes field related 100 questions for 200 marks. Time duration allotted is 3 hours for a total of 300 marks question paper. Kindly check the image attached above. It explains all the details properly. In case there are any doubts with the exam question paper pattern, let us know in the comment section at the end. Our team will surely get back to you with relevant response. The syllabus for Assistant Professor Online MCQ test includes General Knowledge and field related subjects. The Annexure 2 linked below has it all. Kindly go through the annexure for field related syllabus for the one that suits you. Syllabus for General Knowledge is provided below. Geography, water, mineral resources, climate, and physical conditions. Literature, music, dance, art, and culture of Chhattisgarh. Tribals, dialects, teej, and festivals of Chhattisgarh. Economy, forest, and agriculture of Chhattisgarh. Human resources, and energy resources in Chhattisgarh. Education, health, and contemporary events in Chhattisgarh. How to download CGPSC AP Exam Syllabus Online? Among several options provided click on “Notice Board” and select “Advertisement” from drop down. A separate page will open with all the advertisements and notifications. Select one that mentions “Assistant Professor Recruitment”. There would be 4 options available. Among which would be “Annexure 2”. Annexure 2 includes complete CGPSC Assistant Professor Syllabus. Or you can simply click on the direct link below and download syllabus. 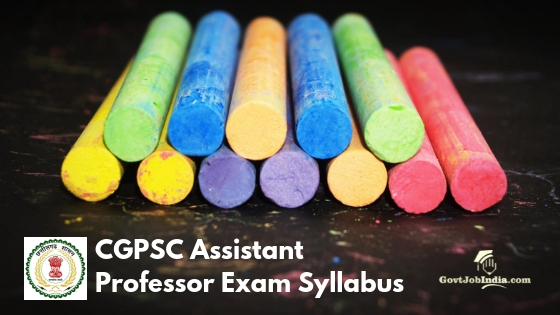 We believe you were able to know all the important details regarding CGPSC Assistant Professor Exam Syllabus from the above article. Please enter any of your questions or queries in the comment section. We will certainly get back to you. Bookmark the page to receive significant updates and notifications. For more Government job opportunities near you visit our website @ govtjobindia.com. You can also subscribe to receive latest job openings and know options as per various education qualifications, location, as well as sectors. All the best!